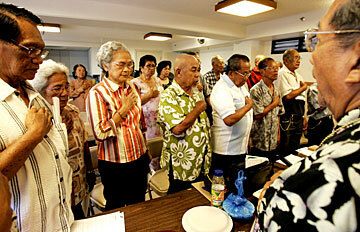 Members of the World War II Fil-Am Veterans Association put their hands over their hearts as they sang the "Star- Spangled Banner" prior to their meeting Sunday at Hale Hali'a in Kalihi. IT WAS TWO YEARS ago when a memorial was dedicated at the Filipino Community Center to honor the thousands of native Filipinos who fought alongside U.S. military forces in World War II. Back then, Art Caleda was hopeful that the U.S. Congress and the president's recognition of the veterans' contributions would not be far behind. But the wait continues for Caleda and thousands of other Filipinos like him, who fought the Japanese to protect U.S. interests in their native country. 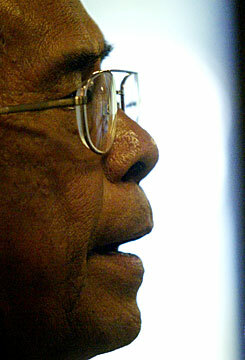 "It has dragged on for so long a time," said the 82-year-old Caleda. Now, as the Filipino community prepares to celebrate a centennial in Hawaii, Caleda and other veterans are hopeful that their efforts are remembered as they continue their push for full veterans benefits from the U.S. government. As part of the centennial celebration, a ceremony is planned for Veterans Day 2006, to remember those who fought in the war and to celebrate the anniversary of the Fil-Com Center memorial in Waipahu. "It will be symbolic of the sacrifices and the heroic events that the veterans suffered during the war," said Caleda, president of the World War II Fil-Am Veterans and Ladies Auxiliary, Hawaii Chapter. The group, which boasts about 800 members in Hawaii, has other events planned throughout the coming year to increase public awareness of the veterans' cause. For veterans, the denial of benefits amounts to a broken promise. Roughly 120,000 Filipinos were drafted in 1941 to serve alongside U.S. soldiers in defending the Philippines -- an American commonwealth at the time -- during World War II. Under an order signed by President Franklin D. Roosevelt, those soldiers were promised the same veterans' benefits as American servicemen. CONGRESS RESCINDED that pledge in 1946, when the Philippines gained independence. While Filipinos who served directly in the U.S. armed forces and those who now live in the United States qualify for some programs administered by the Secretary of Veterans Affairs, many still seek the full benefits that were promised, including health care, pension and survivor and burial benefits. Two bills alive in Congress now would restore Roosevelt's promise, but they face an uphill battle in getting heard before the end of the year. Similar bills have stalled in the past, largely because of budget concerns. Some estimates place the price tag between $100 million and $150 million a year over 10 years. Filipino World War II veterans are estimated to number 58,000, including 12,000 in the United States and about 2,000 in Hawaii. With many in their 70s and 80s, supporters of the legislation say time is running out. "It will be symbolic of the sacrifices and the heroic events that the veterans suffered during the war," said Art Caleda of ceremonies planned for Veterans Day next year to honor Filipinos who fought alongside U.S. soldiers during World War II. A look at legislation pending in the U.S. Congress that would grant full benefits, under programs administered by the secretary of veterans affairs, to Filipinos who fought alongside U.S. military forces during World War II. » Senate: S. 146, introduced by Sen. Daniel Inouye (D, Hawaii). Read twice and referred to the Committee on Veterans' Affairs. » Title: Filipino Veterans Equity Act of 2005. » Purpose: To amend title 38, United States Code, to deem certain service in the organized military forces of the Government of the Commonwealth of the Philippines and the Philippine Scouts to have been active service for purposes of benefits under programs administered by the Secretary of Veterans Affairs. "Hundreds, if not thousands, of people who fought in that war who would benefit from the benefits they were promised, are dying every year," said David Pendleton, a former Hawaii state representative who testified in support of the federal benefits before Congress in the late 1990s. "At a certain point, if we pass the Filipino Veterans Equity Act, there won't be anybody alive to participate in that program," said Pendleton, now a senior policy analyst for Gov. Linda Lingle. "It would be a moral wrong to wait until everyone died, pass it, and then there's no one who's entitled to be able to benefit from that because all of the Filipino veterans who fought in that war passed away." Pendleton, who is half Filipino, said relatives of his who would have benefited from the federal recognition have died. FOR VETERANS like 79-year-old Dominador Garcia, it is a matter of justice. "It was not a fight between the Philippines and the Japanese, but a fight between the United States and the Japanese," he said. "We were involved to protect our country and help protect democracy and liberty. "Were it not for the volunteerism or the enlistment of the Filipino soldiers with the American forces, there would be nothing in the life of the Philippines," he added. "Upon involving us, they promised the federal benefits and services of the veterans. "That's the importance of it." 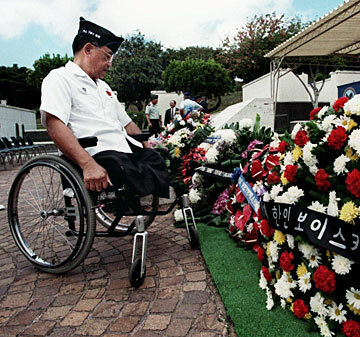 Veteran Alfred Los Banos attends ceremonies marking the 48th anniversary of the Korean War. >> Island Television News at 5: Mixed Plate Mabuhay takes you to Novaliches in the Philippines, then to the Hawaii marketplace where new Filipino immigrants feel right at home. >> Island Television News at 10: Filipino workers played a major role in the growth of Hawaii’s labor unions. Talk story with a Filipino labor leader who is proud of his Filipino and American roots.